Herbert Hoover once said that “fishing is much more than fish. It is the great occasion when we may return to the fine simplicity of our forefathers.” But where’s the simplicity when you need to change split rings, remove hooks, cut line and bend wires and you don’t have a good pair of fishing pliers? This is one of the most easily overlooked pieces of fishing equipment, and the one that you remember only when you are in desperate need of it. But believe us, regardless of whether you are an amateur in the world of fishing or a passionate fisherman, you will be in need of quality fishing pliers, sooner rather than later. Before we move onto the selection of the best fishing pliers, here are some buying tips that should clear up the criteria we used to choose the winner. 1.7 Is The Price Acceptable For You? Every tool is as good as the material it is made of. The same goes for the fishing pliers. You don’t need a pair of fishing pliers which will be rendered ineffective after just a couple of uses by rusting shut. Stainless steel is always a good choice of material for any tool, but you should be careful not to go for the cheaper option because this material can still rust. High quality is always a better idea. While this material was the ruler of the fishing pliers market for decades, now we have a new player in the field, and it’s called aluminum. Aluminum may be the best choice. This material is rigid, and it doesn’t rust that quickly. Furthermore, it is lightweight, which makes it easy to carry and manage. The best models on the market are made of airport-grade aluminum. However, since aluminum is very soft in composition, it cannot hold up very effectively for jaws and line cutters. Some manufacturers are addressing this issue by using different metals in these areas. One example of that is coating them with Teflon. While the material determines the quality of the fishing pliers, the nose design and length have a lot to do with functionality. The most commonly used design is needle nose pliers because their design and length allow the tool to go deeper into the fish, which is essential for big fish. Such fish is usually found in salt waters. Some pliers are designed with a hooked nose. Side cutters serve to cut off a shank of a hook if it gets buried in the gear or in your flesh, which is the worst possible outcome. If the side cutters aren’t robust enough to do that, they’ll become dull or perhaps even break under that kind of pressure. On the other hand, line cutters should help you with cutting monofilament, braided, and fluorocarbon line when the side cutters are not sufficient. That’s why you should search for sharpened and hardened line cutters. Some high-quality fishing pliers have replaceable side and line cutters so that you don’t have to worry when they wear out. There are days when you catch a fish or two, and then there are those glory days when you catch loads of fish. Obviously, the latter outcome is much more preferred, but it will require using the fishing pliers a lot to cut and remove the hooks. If the grip handle is uncomfortable to hold and manage, such days will include more pain than joy. And if the handle is slippery, it can even make you prone to injuries. 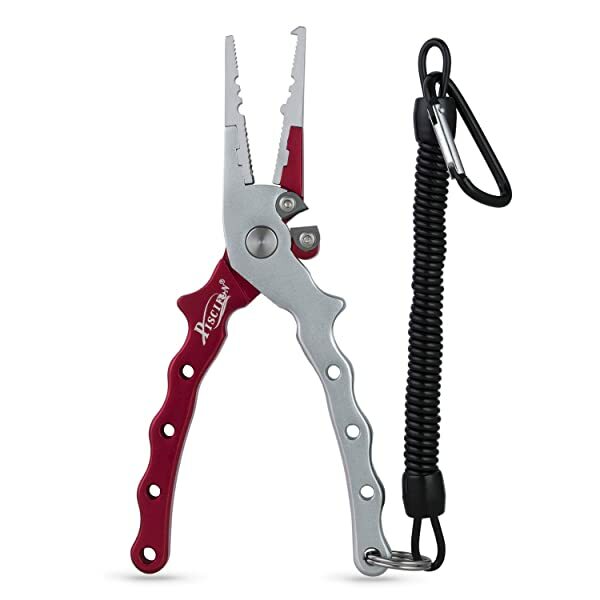 Look for fishing pliers with soft, easy to grip and non-slip handles, and you will encounter no such problems. The handles are made of different materials, including rubber, plastic, metal, and silicone. Silicone handles beat all three of them by being the least slippery and the least prone to corrosion and retaining odors. Not every pair of fishing pliers is equipped with the bonus addition of a split ring tool, and it is a feature you will appreciate when you need to replace a hook. Without this feature, this task will be far more difficult, and it will require you to do it by hand which can be very clumsy. Split ring tool is one of the best bonus functions that come with fishing pliers, but some manufacturers do their best to make their product more appealing with even more additional capabilities. Is The Price Acceptable For You? The price is important when choosing any product. Depending on the product features, materials, quality and even the manufacturer’s history, the price for a good pair of pliers can vary significantly. Your investment will be determined by how passionate you are about fishing, but you should know that more expensive product is not always a better one too. It is important to question all the features we have mentioned above and look for the top quality, especially if you are going on fishing trips regularly. Now that we’ve covered all the factors that should impact your purchase decision, it is the perfect moment to see how five of the top rated fishing pliers rise to the standards we have set. If you care much about the appearance of your fishing equipment, you will definitely love MadBite pliers which are available in various colors, including yellow, blue and red. But do these pliers have something more to offer beyond aesthetics? Of course, they do. The material they are made of is aerospace-grade aluminum alloy, which makes them both heavy-duty and lightweight. The material is so strong that it allows quick hook removal even from toothy fish. 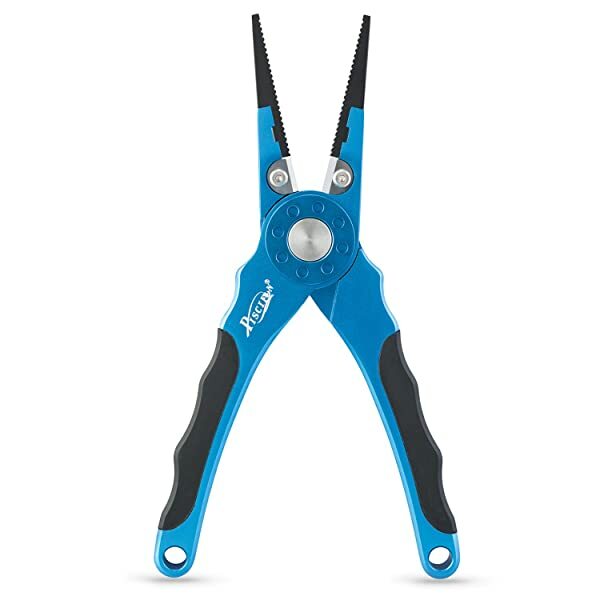 One of the best features of these pliers is their superior silicone grips. They are not prone to corrosion as some metal handles, and they do not retain odors as some rubber handles. Also, they are not at all slippery. The braid cutters are on the outside, and they’re rather efficient. The nose is too short for big fish such as striped bass, but it does an excellent job on fish under 12 inches. Although the case is an excellent addition, it does have a Velcro strap over the pliers so it one-hand retrieval which is often necessary is impeded. The BITE fishing pliers are made of heat-treated anodized aluminum alloy, so as for the material choice they belong to those high-end tools we mentioned. The manufacturer also uses to the max the fact that aluminum is easy to paint, so this pair is colored in an appealing shade of blue. They also hold up very well when it comes to the strength of the cutters since they’re reinforced with tungsten, which is considered to be one of the toughest things found in nature. As if that is not enough, the cutters are fully replaceable. The jaws can also be replaced, and they are manufactured of stainless steel. As for the aluminum, it is very resistant to corrosion. Other commendable features are rubber insert grip which prevents slipping and makes holding comfortable. Everything said up until now points to these being the fishing pliers for a lifetime, but are they? Well, while aluminum doesn’t rust, the stainless steel jaws are affected by rust really fast. The sheath is a little shallow for the pliers too. This pair of pliers is made of stainless steel. They have a very long needle nose, which makes them perfect for going deeper into the fish, a necessary feature for those of you who love a big catch. The nose is slightly bent for hook removal. 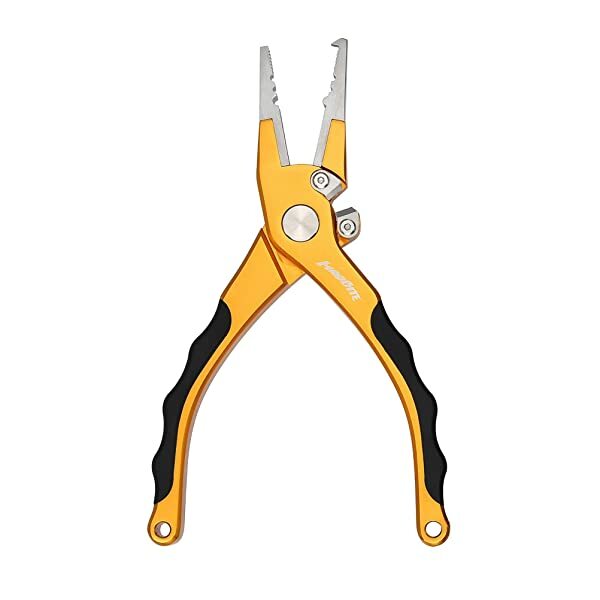 The pliers are equipped with spring loaded jaws, accurate split rings, a fairly sharp line cutter and light angling tool. You can rely on this product not only for salt fishing but also for river and lake fishing and ice fishing. They are easy to use and precise. However, although they are sold as corrosion resistant, the stainless steel is prone to rust, so they require you to rinse them in fresh water after use in salt water and dry them off. Also, the handle is a bit slick, and the serrated tip is not aggressive enough to hold the hook very well. The latch in charge of holding the pliers closed does not hold well. The Piscifun are made of aircraft-grade aluminum alloy, but the jaws are made of stainless steel and additionally coated with titanium to ensure extra strength and durability, which is probably why the price is a bit higher from what we would call affordable for this type of product. As if that isn’t praise-worthy enough the cutters are fully replaceable and made of one of the strongest materials on earth – tungsten. With such cutter, it is a true breeze to cut even the heaviest mono leader, the strongest braided lines and fly and back lines. The aluminum doesn’t show signs of oxidation and rust, even after a long period of using this tool. The handles are pretty ergonomic and they are made of a combination of plastic and rubber. It is easy to hold and use. However, although the choice of materials should suggest that the handles are not slippery, that is far from being true. A major issue we have with these pliers is that, for their price, they could be of better-built quality, but instead, they are easy to break and go dull. Another Piscifun product, only this one comes at a much lower price. “Why,” you ask? We conclude that this is mostly because of the handles. The handles on this pair of pliers are not covered with rubber, plastic or silicone. Instead, they are of the same material as the pliers – aircraft-grade aluminum. Although the manufacturer sells this as a positive feature that makes the tool much lighter, we beg to differ. This tool is lightweight as it is, but the lack of proper handles makes it uncomfortable and painful to use, especially if you are going to use it for more than just a couple of minutes. However, don’t think that these pliers don’t have a couple of good things going for them. For once, the stainless steel jaws are titanium coated, and the cutters are made of tungsten. They work very well when it comes to cutting braided lines. All of these pliers have something going for them, and each of them can stand toe to toe with many high-end fishing tools. Your choice will depend on what kind of fishing you prefer. 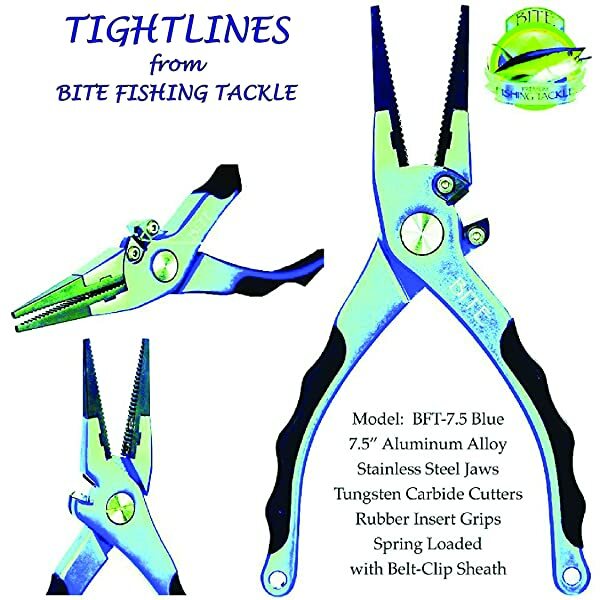 If it is big fish, you are after, then look no further than The Fishing Tree Fishing Pliers. They are the only ones on the list equipped with a nose long enough to remove the hooks from big fish such as striped bass. If that is not your priority and you want to choose a product with other qualities in mind, we recommend the MadBite Fishing Pliers as a clear winner of this clash of the titans. 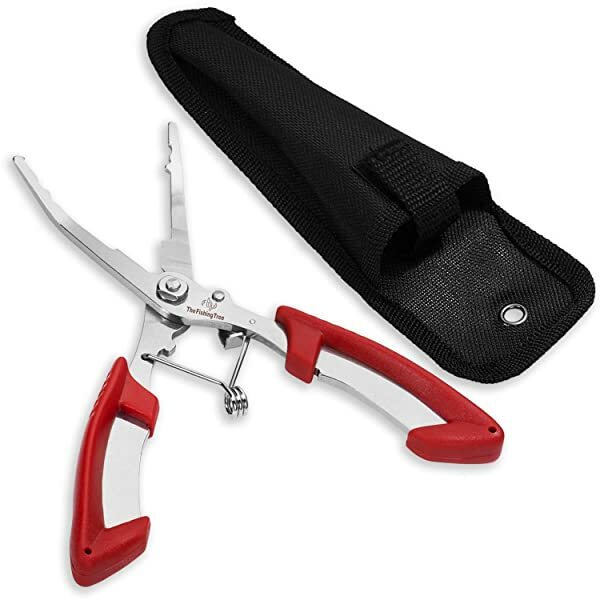 Despite some minor flaws, such as Velcro strap getting in the way of one-hand retrieval and a short nose, this tool excels where it counts, providing you with ergonomic handles, sharp cutters, functional jaws, strength, and durability. Plus, there is a cherry on top – eye candy design, which not only looks beautiful, but it also makes the pliers visible when it’s dark or when they’re lost at the bottom of your fishing bag.